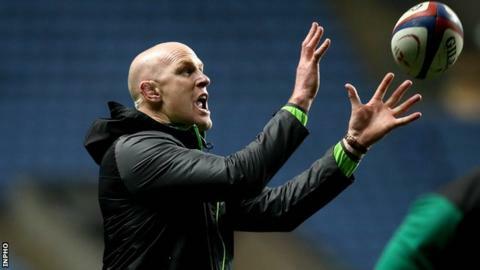 Former Ireland captain Paul O'Connell will step down from his role as Stade Francais forwards coach at the end of this season. The ex-Munster lock joined the backroom team of Stade head coach Heyneke Meyer on a one-year deal last August. Stade Francais described O'Connell's decision as a "mutual agreement". O'Connell, 39, has been linked with a coaching role at Toulon but said on Tuesday that he did "not envisage joining another club next season". "I have had a great adventure at the Stade Français," added O'Connell. "I am grateful to the club for the opportunity they gave me to live and work in Paris. I was delighted to be able to work alongside Heyneke Meyer, the staff and all the club's players." Stade Francais' statement said the former British and Irish Lions captain would "always be considered a member of the Stade Francais Paris family". The Parisian outfit are eighth in the Top 14 table - a point off the play-off places. The Munster great won 108 Ireland caps but retired in February 2016 because of a severe hamstring injury. O'Connell's final game was Ireland's World Cup victory over France in October 2015, when he sustained what proved to be the career-ending injury. After that, O'Connell worked in an advisory role for Munster's academy, in addition to an assistant coach's role with the Ireland Under-20 team, before taking up the Stade Francais post. O'Connell's seven appearances for the Lions included captaining the side in the Test series defeat by South Africa in 2009.